Home / Artist / Demi Lovato / Fashion / Gabriel & Co / InStyle Magazine / Jewellery / Magazine / Demi Lovato Dazzles in Gabriel & Co.
Demi Lovato Dazzles in Gabriel & Co.
Demi Lovato, the superstar singer, songwriter and actress, graces the new April InStyle cover wearing Gabriel & Co.'s 14k White Gold 80MM Classic Hoop Diamond Earrings (EG12606W45JJ). The unique statement hoops features diamonds on the outside front and inside back of the hoop. Demi stuns in the issue, which will hit newsstands March 16th, as she opens up about her past struggles and the power of finding and using your voice. The cover is not the first time Lovato has rocked her Gabriel hoops. The show-stopping earrings have become a wardrobe staple while on her "Tell Me You Love Me" tour which is set to hit major cities including Miami, Buenos Airesand London in 2018. Demi Lovato's organic love of Gabriel & Co. speaks to the brands' knack for creating pieces that are both timeless and trendy, the combination of which has garnered countless celebrity fans. "It is always a great honor when anyone wears our designs but it comes at an even higher triumph when someone like Demi Lovato does. Demi not only exudes confidence and great personal style," says Senior Vice President and Chief Design Officer, Dominick Gabriel, "but she also continues to demonstrate what it means to be a strong role model, and a strong woman, to millions of people around the world." The fine jewelry brand continues to create beautiful, wearable jewelry that aims to make the women who wear it feel confident and empowered in their everyday lives. 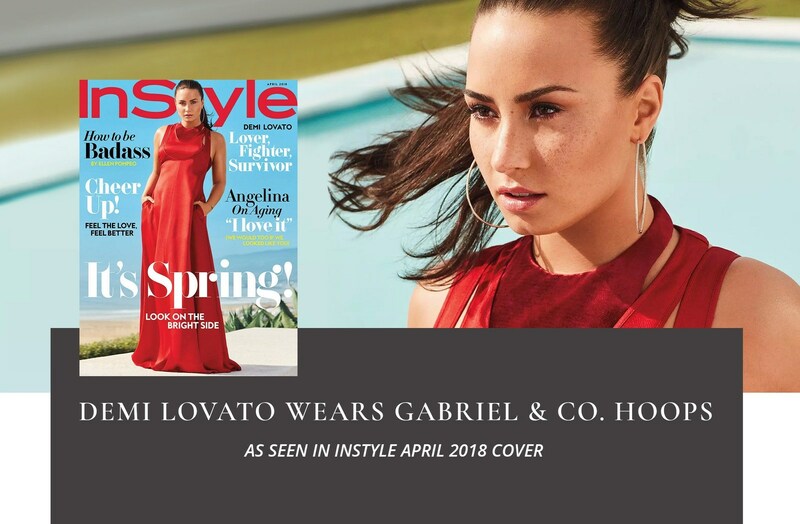 To check out more of Demi in Gabriel & Co., be sure to check out InStyle's Instagram and website or pick up a copy of the April issue that hit newsstands March 16th. Also be sure to be following Gabriel's Instagram and Facebook page for all Collection updates!